If you are going to do something well, you should do it with the professionals. 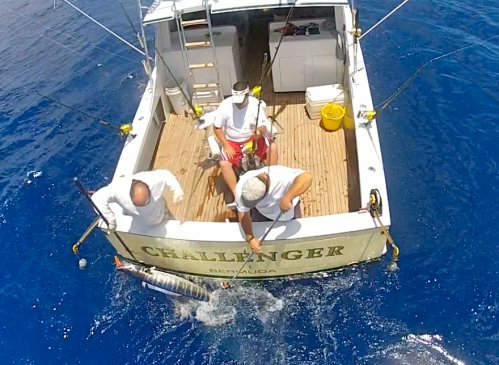 So if you want to go offshore fishing for some huge Marlin, then you need to book a trip with Challenger Charter Fishing Bermuda today. Father and son duo, Captain Alan Card and Ian Card, look forward to welcoming you on board. Capt. Alan has over 4 decades of experience in the charter business, and Ian has been working beside him for over 2 decades. 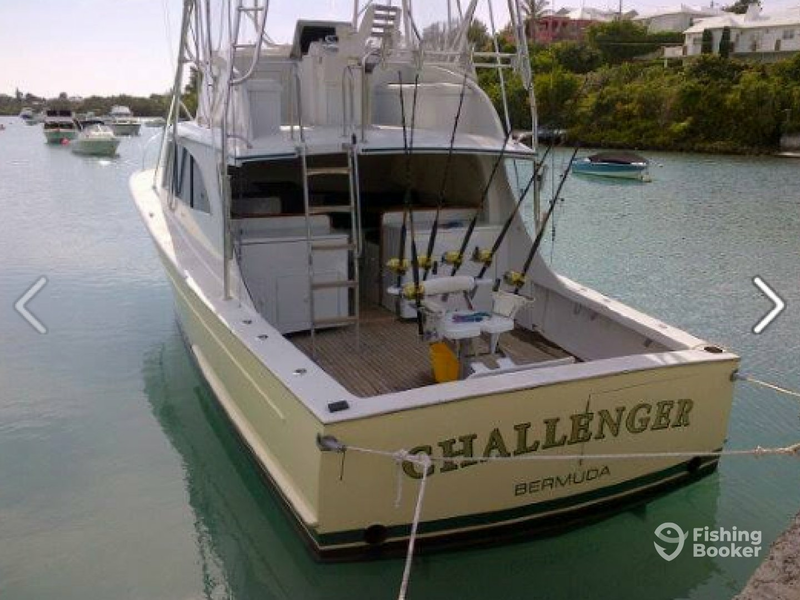 Hop on board their 40’ Gamefisherman “Challenger’. This beautiful boat is fast and can reach speeds of 30 knots. 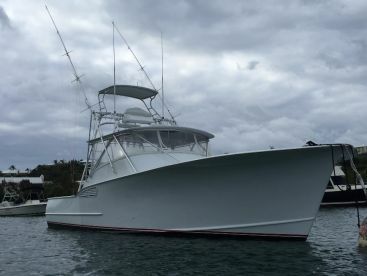 Her twin engines will get you to the fishing grounds before you know it. 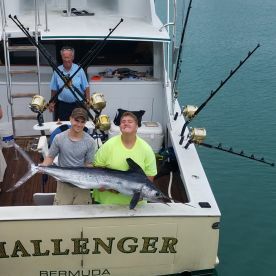 This vessel is well-kept, clean, has a tuna tower, and a large cockpit with a fighting chair – when you are reeling in big game you’ll be relieved to have this on board! To help with the fishing there is also a fishfinder on board. This, paired with the captain’s extensive knowledge of the area, will make sure your day is productive. These guys are experts for a reason – Capt. 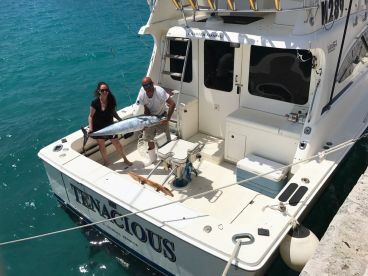 Alan personally holds the World Record for a 42.5 lb Blackfin Tuna on a 50 lb test line, as well as reeling in 6 of the largest Blue Marlin in Bermuda’s waters weighing over 1100 lb. 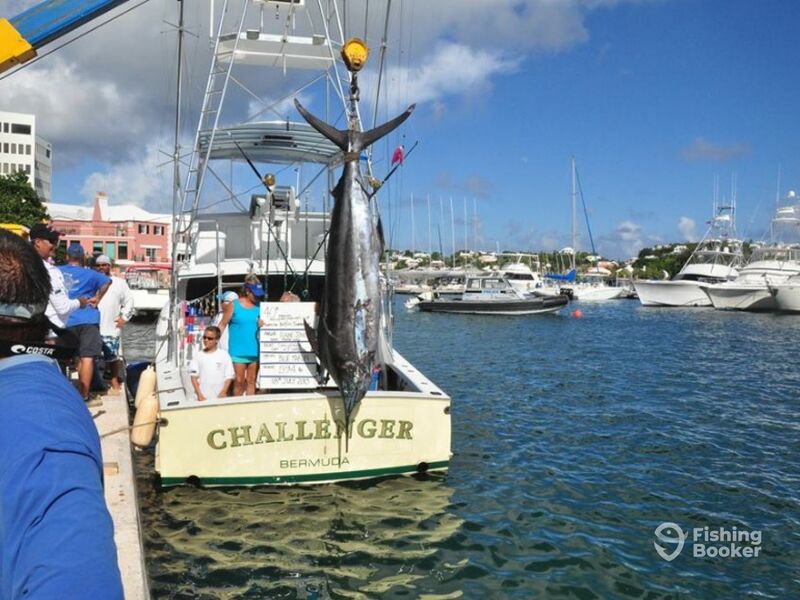 Ian holds the Bermuda Record for the largest Mako Shark, weighing an impressive 821 lb. Although it’s unlikely you’ll reel in a Marlin, Tuna, or Shark this big, you’ll definitely have a better chance of catching one with this crew. 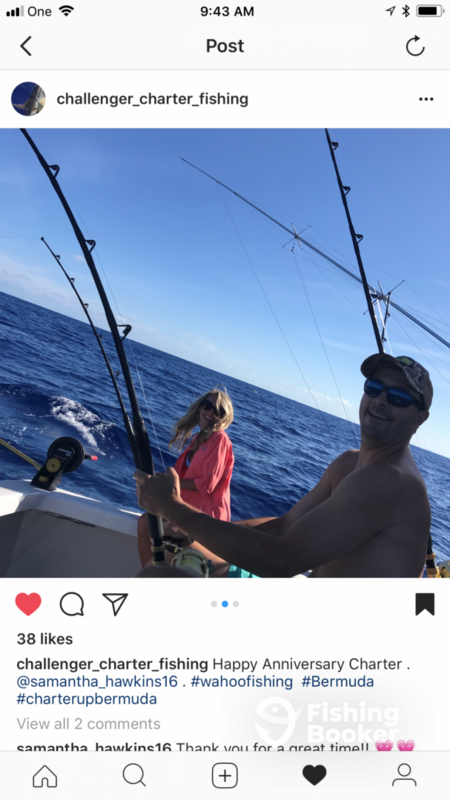 Also expect to catch Mahi Mahi, Barracuda, and Red Snapper. 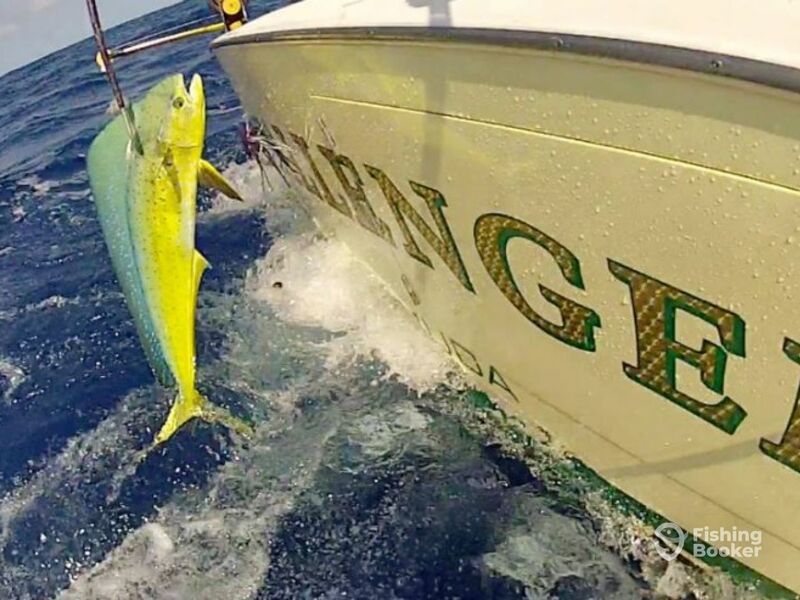 Some species you’ll be able to keep, which the captain will fillet for you. 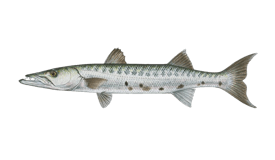 Included in the price are all fishing rods, reels, bait, and lures. 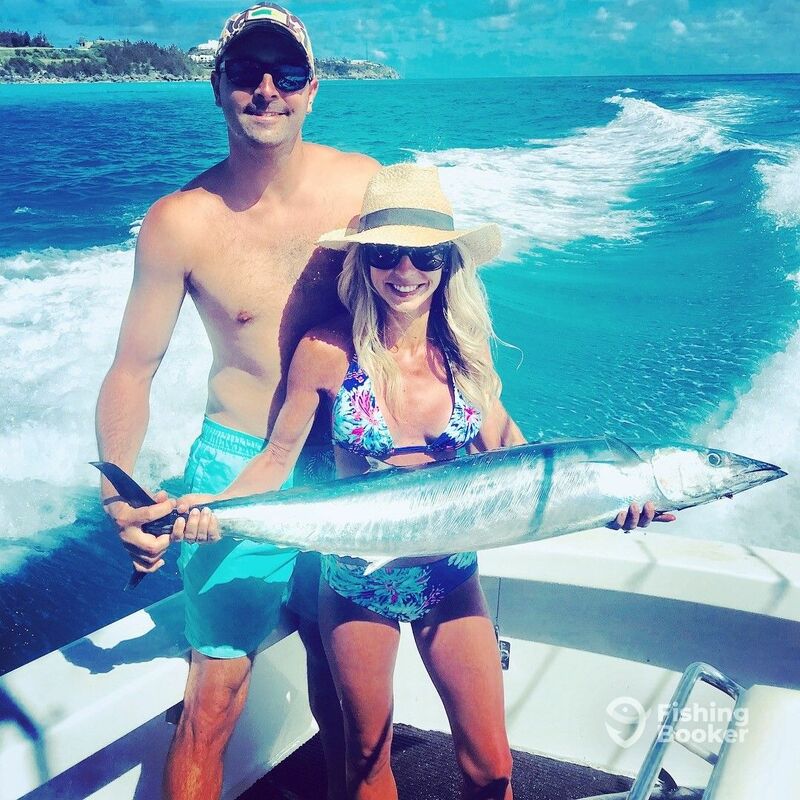 You’ll be using top quality gear that won’t let you down when reeling in your trophy catch, personal best, or even first ever fish! Book now for an unforgettable trip. 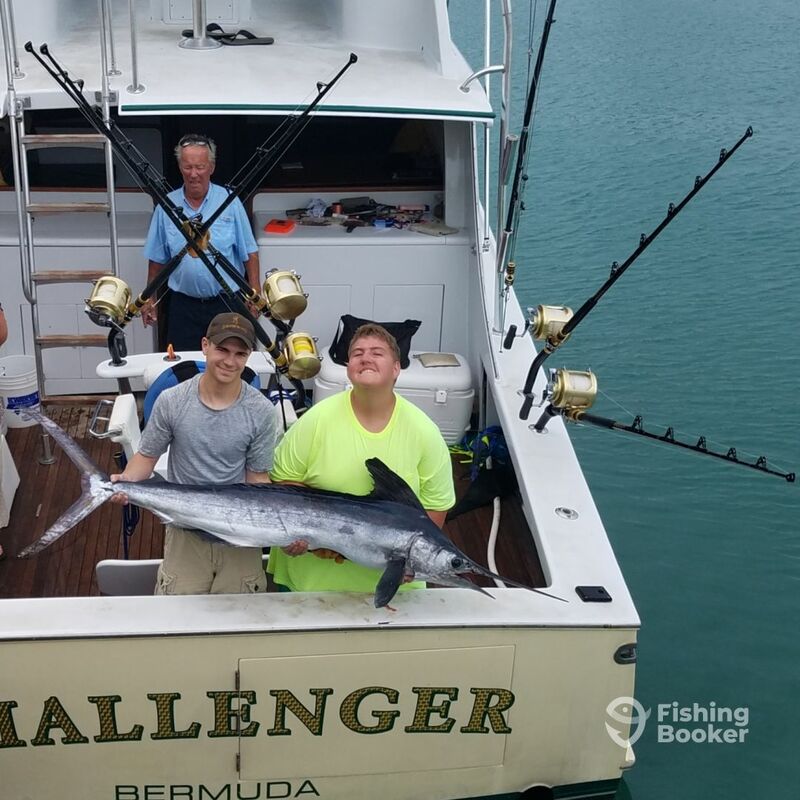 This dynamic duo can’t wait to welcome you on to the Challenger and help you have an awesome fishing trip. 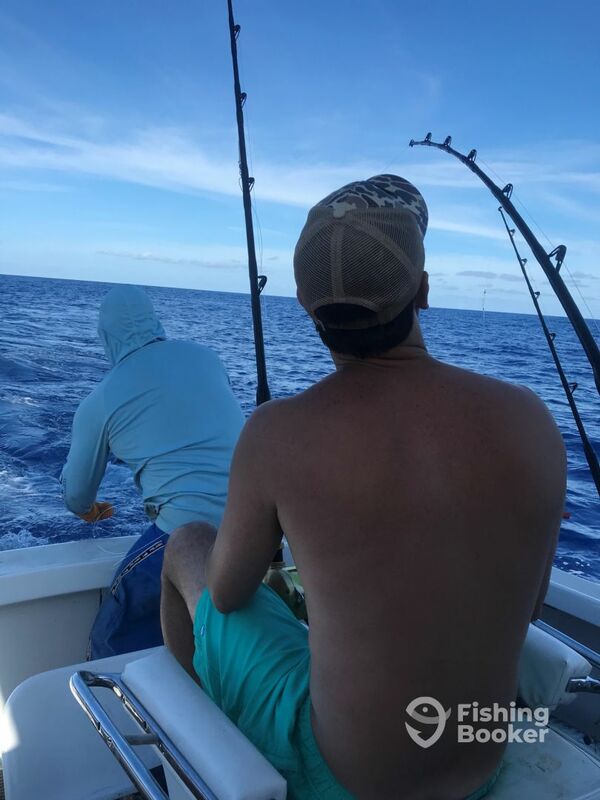 This trip gives you the best chance to hook a Marlin. You'll head further out and will have enough time to stalk your prey. 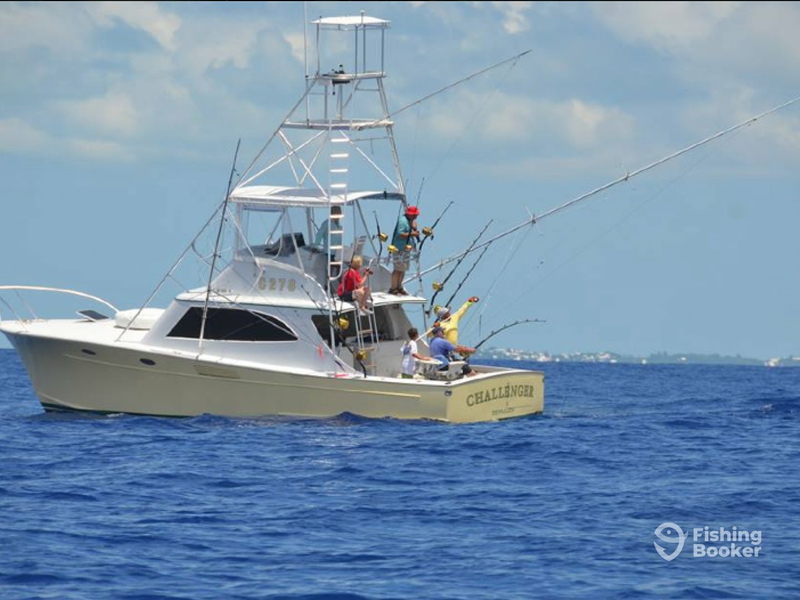 All fishing equipment is included in the price, including rods, reels, live bait, and lures. Please bring a packed lunch for the day. 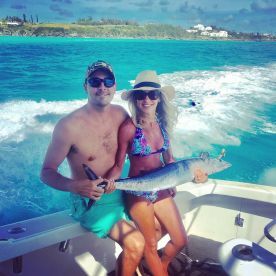 This trip will take you further out, so you can target Mahi Mahi, Red Snapper, Barracuda, and more. All fishing rods and reels, live bait, and lures are included in the price. Please bring along snacks and drinks. 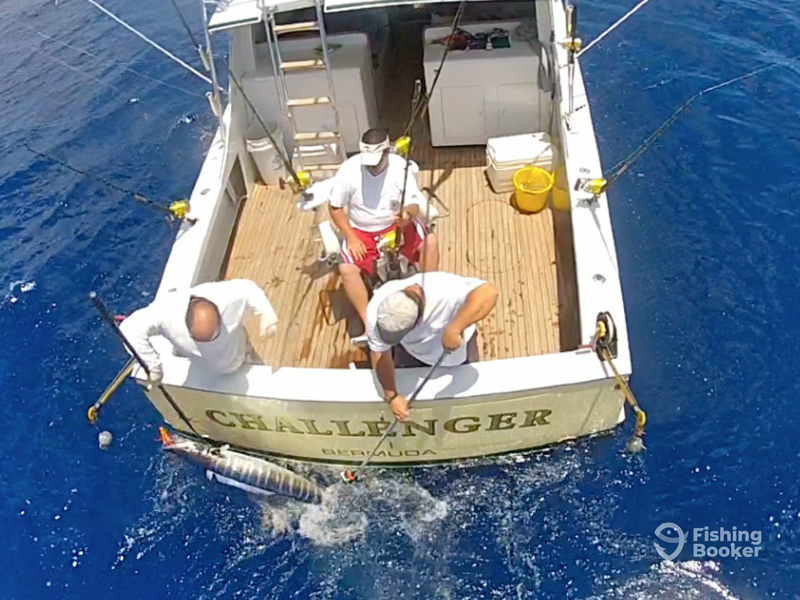 Spend 4 hours going after Barracuda, Red Snapper, and more. All rods and reels are included in the price. You are welcome to bring your own refreshments. This 4 hour trip is great for families. Target Red Snapper, Barracuda, and more. 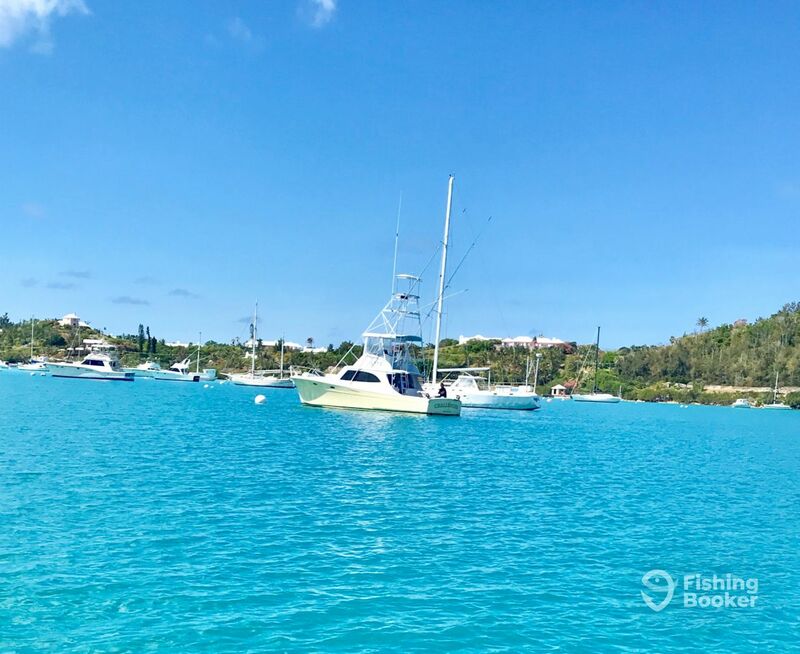 All fishing gear and equipment are included. You can bring your own drinks and snacks.